On the shores of Israel’s Galilee, an ancient town has been brought to life. The new bonds built among its ruins could last for generations to come. On a recent Sunday afternoon, Gladis Sabat was among dozens of women from around the world who toured the ruins of a 1st century synagogue on the western shore of the Sea of Galilee. Sabat, a Palestinian Roman Catholic from Jerusalem, comes here a few times a year to pray on the site of the ancient Jewish town of Magdala. Mentioned in the Talmud for its thriving fish market and by the ancient historian Josephus for the strong stand it took during the revolt against Rome from 66-73 CE, Magdala has become a site that brings together the ancient and modern worlds of Judaism and Christianity alike. The ruins found here — a synagogue, a harbor, and a fish market — offer Sabat and other Christians a tangible connection to the days when their faith began to emerge out of Judaism, as well as to Mary Magdalene, a troubled woman who was an early follower of Jesus and one of the few women mentioned in the Christian Bible. Magdala is believed to be her hometown. For the last two thousand years, Magdala was known only through the Bible, the Talmud, and other ancient texts, though the name remained associated with the area. A town established nearby in 1910 by Russian Zionists was called Migdal, and an Arab village called al-Majdal was located in the area until Israel’s 1948 War of Independence. But all traces of the site’s dramatic 1st century past were buried. 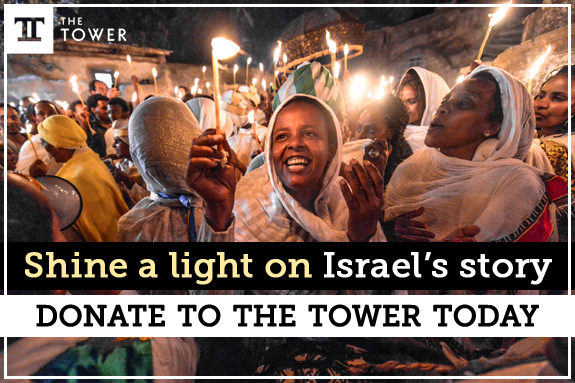 Since archaeologists began discovering ruins here in 2009, however, the ancient town has come back to life, attracting both Christian and Jewish visitors and emerging as a center of interfaith relations. In 2004, when Solana took up his Vatican-appointed post as director of the Notre Dame Center, a 19th century complex just outside Jerusalem’s Old City that contains a chapel and a guest house, he noticed that most visitors who stayed there were also spending time in the Galilee region, home to many sites associated with the life of Jesus. Then, on a trip to the Galilee around this time, he noticed a sign for Magdala. “I said, oh my goodness, this is Mary Magdalene’s hometown, we have to stop,” he recalled, telling me how his own mother often told him that she felt inspired by Mary Magdalene. Solana’s mother was not alone. Mary Magdalene has been a prominent figure in Christian tradition for centuries. She is described in the book of Luke as having “seven demons” inside of her. But when she began to follow Jesus, she was cured and eventually became the first person Jesus appeared to after he rose from the dead. Over the years, Mary Magdalene has been associated with prostitution and at times reputed to be Jesus’ wife or lover, making her a controversial character. But for many Christians, her story is inspiring because she found healing and dignity through her faith in Jesus. Eventually, she became a bearer of the good news, telling others that Jesus had risen. In recent years, the Catholic Church has placed more emphasis on Mary Magdalene, including the establishment last year of a major feast day dedicated to her, celebrated on July 22. With all of this in mind, Solana felt compelled to stop at Magdala. “My driver told me there was nothing there, but we stopped anyway,” he said. His driver was partially right. At the time, Magdala contained only an old and shuttered beach resort, overgrown grass, and some palm trees. But Solana noticed that the resort was for sale. “I thought, that’s the perfect place for the partner guest house: it’s in Magdala, on the sea shore, and close to all of the holy sites,” he recalled. Over the next five years, Solana raised money from international donors, purchased the old resort and other nearby land, worked with architects to design a 300-room hotel with a restaurant and swimming pool, and was finally ready to break ground on the project in 2009. The last step was for the Israel Antiquities Authority to conduct the archaeological dig required before any construction project in Israel, which is, needless to say, a land rich with ancient remains. Solana assumed that this was just a formality and nothing would be found. But after several days of work, archaeologists uncovered an ancient port, a marketplace, several fish ponds, and other signs of a major fishing industry. Then a short distance away they found an ancient building. They didn’t think much of it until they found what appeared to be a stone bench built into a wall. “I knew right when we found that bench that this was a synagogue,” said Dina Avshalom-Gorni, an archaeologist who directed the project for the Antiquities Authority, explaining that benches built into walls are a classic motif of ancient synagogues. More digging revealed a three-room structure with ample space for storing scrolls and traces of frescoes still adorning some of its collapsed walls. 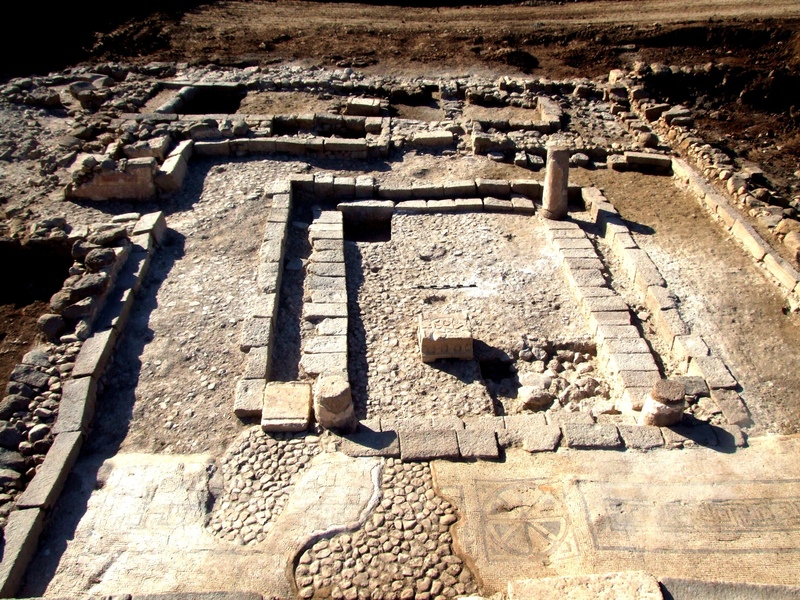 This is the only synagogue from the 1st century — when the Temple was still standing in Jerusalem — that has been found in the Galilee region, and one of only six found in the entire country, including in Gamla and Masada, Avshalom-Gorni said. A stone decorated with rosettes and a seven-branch candelabra, designs used in the Temple, proves that this community was indeed linked to Jerusalem, rather than a breakaway group, she added. All of these findings, plus its geographic location, led archaeologists to identify the site as the ancient town of Magdala. While there is no archaeological evidence of specific people like Mary Magdalene or Jesus, the site itself is close to descriptions found in ancient sources, said Marcela Zapata, an archaeologist from the University of Anahuac in Mexico who worked on the site. Solana was overwhelmed by what the archeologists found. Solana did have to make a slight change in the location of the planned hotel and construction was delayed for several years while archaeologists continued their work. But despite the delays, “all of these findings were immensely beneficial to our project,” he said. While his focus all along had been on providing a place for Christian, specifically Roman Catholic pilgrims, Solana said the discovery caused him to broaden his mission. The identification of the town as ancient Magdala, Solana said, also gives it special significance for women. So instead of just a hotel, he opened the Magdalena Institute, which focuses on promoting the dignity of all people and especially of women. Unlike the hotel, which is still under construction, the Magdalena Institute is now open in a domed building overlooking the Sea of Galilee. The stone floor of one of the building’s chapels is the original floor of a 1st century fish market that once thrived here. They call this the “Encounter Chapel,” hoping it will inspire the same sort of diverse encounters that must have occurred in the busy ancient marketplace. At a recent annual symposium, dozens of women from Israel and around the world gathered at Magdalena to hear stories of inspiring women from various backgrounds. One of the speakers, an Israeli Jew named Yola Reitman, talked about her days working undercover in Africa for the Mossad. Posing as the manager of a diving resort on the Red Sea, Reitman and her colleagues were part of an operation that smuggled about 12,000 Ethiopian Jews out of Sudan to Israel. Participants also heard the life story of Amoun Sleem, who belongs to Jerusalem’s tiny gypsy community, living on the fringes of both Palestinian and Israeli culture. After growing up in poverty and feeling rejected, Sleem became a community leader and runs afterschool programs for gypsy children in Jerusalem, helping them with homework and teaching them about their culture. Such a mixture of voices is the goal of Magdalena, says its director, Jennifer Ristine, who resides on the property and belongs to a Roman Catholic order of consecrated lay women who, while they are not clergy, have taken similar religious vows. One wing of Solana’s hotel, about 80 rooms, is scheduled to open in February. There are also plans for a museum highlighting the archaeological discoveries and telling the story of the town. 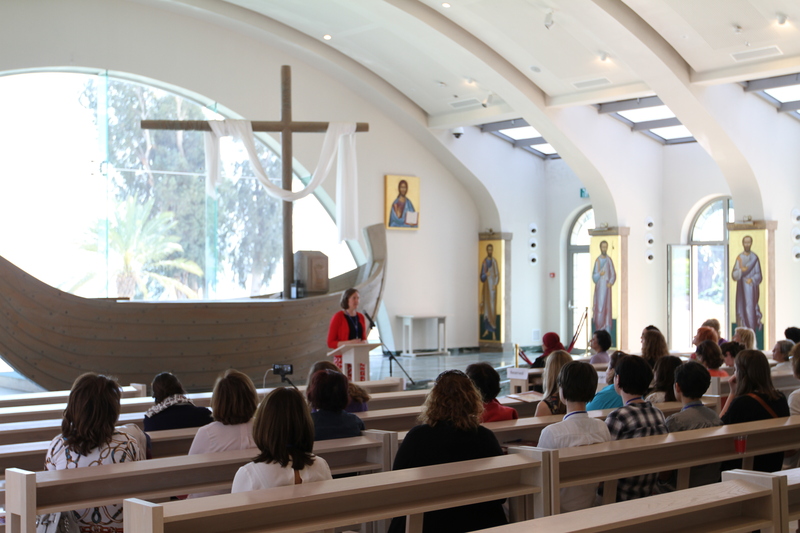 About 1,000 people a day stop at Magdala, mainly to tour the archaeological site, and some walk through the Duc in Altum, which houses the chapels and the Magdalena Institute. Most visitors are Christian or Jewish groups. Avshalom-Gorni has since held bar mitzvah ceremonies for two of her sons in the remains of the ancient synagogue. According to archaeological evidence, when war between the local Jewish population and the Romans broke out in 67 CE, the people of Magdala took down the pillars of the synagogue and used them to block the road leading to the town. Although some life in the town continued after the war, the synagogue was not rebuilt and remained unused until now. 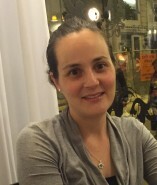 Solana admits that for a Catholic organization to focus so much on the Jewish roots of Christianity and interfaith initiatives is unique in Israel. But there is no other choice. “It is the facts of Magdala that really pushed us in this direction, and it is a new and very special approach,” he said. “What Magdala does is offer us a very real thing, this very real place.” Indeed, Magdala is one of the few places in the country for women’s interfaith discussions that are not focused on the Israeli-Palestinian conflict. This is also extremely important for Solana.